Offering you a complete choice of products which include rubber floor gym tiles. Available Weight Less than 1050 Kg per Cu.M. 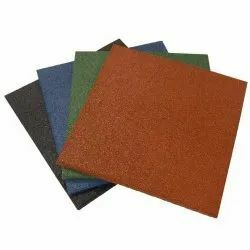 We manufacture and supply rubber floor tiles with environment friendly recyclable rubber material for indoor and outdoor floor surfaces. PERFECTiles feature a nearly indestructible construction, perfect for covering gym and fitness centre floors. These tiles measure 500mm x 500mm and are designed to piece together with bevel edges. Tile thickness ranges from 10mm to 30mm. PERFECTiles are offered in basic black, mono-colours and multi-colours as per customer’s choice. Great for covering custom floor spaces! Noise cancelling and vibration inhibiting! Durable, shock resistant, and comfortable. Seamlessly piece-together multiple tiles to cover large floor spaces.